Bill Steber’s studio is as big as, well, all outdoors. That’s where he shoots these days, and the 160-year old collodion wet plate process (think iconic Civil War photographs) he uses doesn’t give him enough time to shoot at one location and make it to another to do the darkroom work. The entire post-capture process must be accomplished within 7-15 minutes, depending on weather conditions and temperature, before the liquid collodion dries. So, Bill carries the “darkroom” with him. 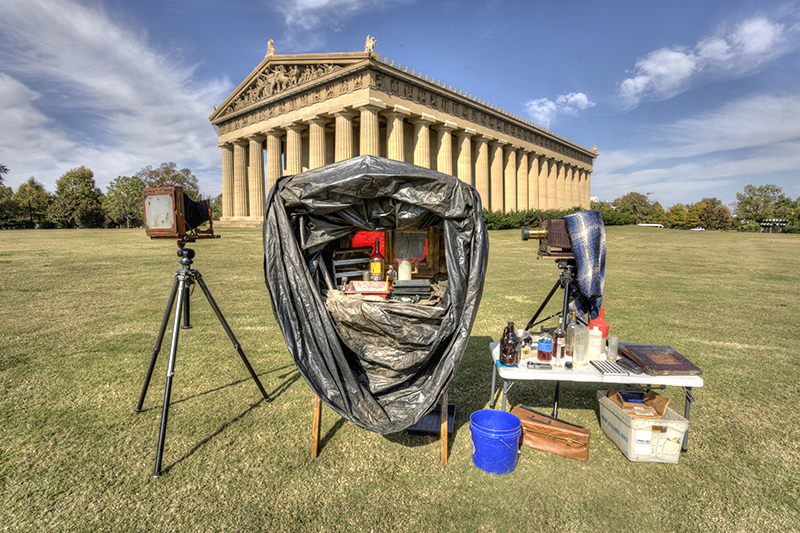 He put his cameras and equipment together over the span of a couple of years, buying dry plate-era view cameras online and having them converted to wet plate by Ray Morganweck, who also built his silver bath. The dark box was built by a local craftsman using Bill’s specifications, and the brass lenses were purchased from online auctions. Ironically, this incredibly tightly timed exercise forces the artist to slow down, way down. Those of us that use digital cameras can tend to have a spasmodic trigger finger that is often in rapid fire mode. Taking another shot or 20 more shots of the same scene doesn’t cost anything, so, why not, right? Wrong. If we fall prey to that, we may trade the best we could do with any particular subject for something far less special. Bill Steber takes all the time he needs to locate that perfect subject and the perfect angle with the perfect light before he releases the shutter and sets in motion the race to the finished photograph.